Aspiring Korean speakers are virtually all over the world now, thanks to the borderless travel of Korean pop culture. 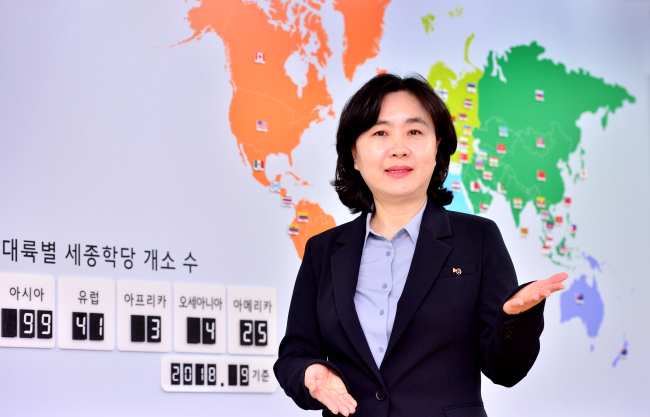 To reach them, the King Sejong Institute plans to go beyond its physical limitations and provide an extensive range of online classes, said Kang Hyoun-hwa, chief of the state-run institution that oversees some 170 Korean language centers worldwide. “On a recent business trip, I looked down from the airplane window on the so many islands that make up Indonesia. Then it struck me. What’s the significance of us having four branches in this island nation? If we added more, would it ever be enough?” posed the president of King Sejong Institute Foundation in a recent interview in her office in Seoul. “New branches are good, but we need a better outreach model,” she said. To find the answer, Kang, who taught at Yonsei University before taking the job in September last year, has her eyes fixed on e-learning. Building from the foundation’s existing website at www.sejonghakdang.org, she envisions a thriving online learning community where a generation raised on YouTube and social media can turn curiosity into a comprehensive study experience. “I want to make self-learning possible from the beginner level all the way to the very high level, with online classes, level tests and evaluations, individually assigned study coaches and even a chatbot,” she said. Her vision has garnered bipartisan support at the legislature and the foundation has received an extra 1 billion won ($878,000) on top of its annual budget this year to realize it. At present, 172 physical King Sejong institutes cater to 57,000 students in 56 countries annually. That is remarkable growth already, given that in its inaugural year of 2007 there were just 13 branches in three countries. “Many contact us hoping to set up a new Sejong Institute in their area. If we had allowed them all, the tally (of centers) would have passed 200,” said Kang, who has studied her mother tongue throughout her academic career. With such strong demand from the ground, Kang expects the branch tally to surpass 200 next year. But she wants to channel more resources into “priority areas” such as Africa, where the Sejong Institute has a less visible presence. Asia has most language centers at 99, followed by Europe with 41 and the Americas at 25. There are just three branches in all of Africa, and four in Oceania. Having studied Korean as a linguist and now heading a governmental effort to disseminate the language globally, Kang often reflects on her own studies and research and realizes what she could not see back then. “Now I see the importance of a bottom-up approach in language teaching,” she said, stressing tailored approaches for specific learner groups. A gulf lies between Vietnamese and Belgian learners, or between K-pop fans and those married to Koreans, the former professor explained. Under Kang’s stewardship, the foundation is also developing a new Korean proficiency test that measures one’s general ability to communicate in the language, while the existing Test of Proficiency in Korean, administered by the National Institute for International Education and the Ministry of Education, chiefly targets those seeking to enroll in higher education in Korea. “We have already commissioned a study (for the new test) and are aiming for its launch in two years,” Kang said.